TALLAHASSEE, Fla. – Let the postseason begin! Florida State’s track & field teams can turn the page to the postseason following Friday’s Seminole Twilight competition, where freshman Trey Cunningham continued his ascent among the nation’s elite hurdlers and redshirt sophomore walk-on Kayla Maczuga may well have converted personal-bests in two events into her first NCAA postseason appearance. Cunningham dropped his personal-best in the 110-meter hurdles to 13.57 – the No. 6 time in the nation – in a winning effort. Maczuga, just two weeks removed from a bout of pneumonia, began her busy day with a personal-best in the javelin of 44.57 meters (146-2) to finish second behind teammate Lauri Paredes (48.95m/160-7). She followed up with a three-centimeter personal-best in the high jump (1.73m/5-8) for another runner-up performance. The Tampa native moved up four spots to No. 50 in the NCAA East javelin standings – the top 48 advance to the NCAA Preliminary meet – and leaped all the way to No. 37 in the high jump. In a meet more about preparation for next week’s ACC Outdoor Championships at Miami, and beyond, the Noles got some work done. 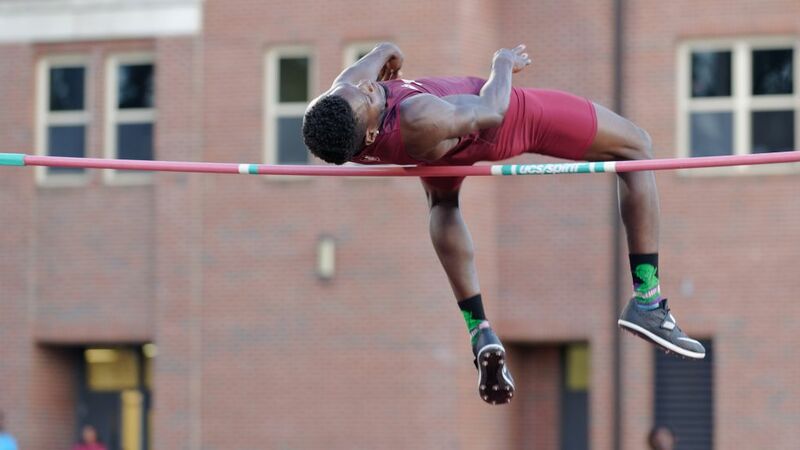 Corion Knight lost his high jump duel with former Nole and NCAA champion James Harris, but his 2.18-meter (7-1.75) clearance was yet another sign of consistency at a high level. Meanwhile, sophomore Eleonora Omoregie opened her high jump season with a 1.70-meter (5-7) effort which should serve as an ice-breaker. Senior Austin Droogsma, the nation’s No. 2 shot putter, won his final meet at Mike Long Track with a winning toss of 20.09 meters (65-11) and added a respectable runner-up discus performance (53.13m/174-3). Equally encouraging was junior Fred Jones’ season debut of 50.31 meters (165-0), which sets the Noles football defensive tackle for a chance to get back to the ACC finals in the event for the second consecutive year. Jayla Kirkland backed up a solid 100-meter dash effort (11.46) with an even better 200 (23.51), which moved her into the NCAA East field for the moment at No. 45. It was the freshman’s first 200 of the season. Among other encouraging signs on the women’s side, sophomore Janae Caldwell was victorious in the 400-meter dash with her collegiate-best time of 55.39, then followed it up with a personal-best in the 200 (24.24.48). In all, the Noles men and women scored five wins each against Division I teams South Alabama and UNF, as well as a host of Division II programs who came to town hunting last-chance NCAA Championship qualifying marks. Beyond the aforementioned winners, Nicole Breske won the pole vault (3.86m/12-8), Ieva Zarankaite claimed the discus (52.95m/173-8), edging teammate Gleneve Grange (50.09/164-4). Sarah Candiano (11:11.77) and Althea Hewitt (PB, 11:16.16) finished 1-2 in the 3000-meter steeplechase. Jen Lima and Kimmie Cunningham were also among Noles posting personal-best performances. Lima was second in the 5000-meter run (18:02.41), while Cunningham ran 12.09 in the 100. Winning efforts by the men were turned in by Ashton Butler in the triple jump (15.10m/49-6.5), Kenneth Fisher in the long jump (7.40m/24-3.5) and Bert Freire in the 800 (1:50.83). 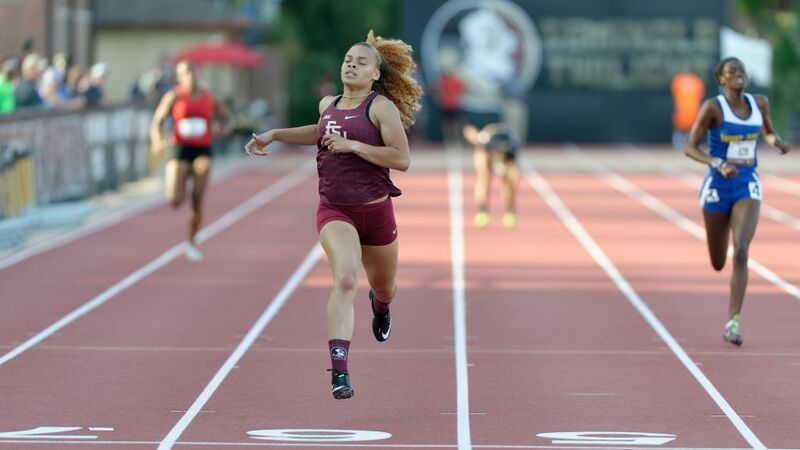 The Seminoles will depart for Coral Gables, Fla. on Tuesday for Thursday’s start of the ACC Outdoor Championships. The 10th-ranked men will be chasing their 13th outdoor title – and first since 2015 – as an encore to their 2018 Indoor crown. FSU’s women will try and extend a pattern of championship success with a fourth outdoor title; the last two of which followed indoor titles, like the one the Noles claimed at Clemson in February.